London does Christmas in style and it needn’t break the bank. Let’s start with the obvious: Wherever you are simply walking in London this Christmas, you’ll find the City awash with awe-inspiring illuminations. From the opulent Oxford Street Christmas lights to the kooky crafted streets of cool Carnaby; or even the beautiful luxury lit Bond Street with magnificent peacock-inspired Christmas lights. Your eyes will be in for a treat in Regent Street, with 300,000 Christmas lights and 16 glowing spirits glittering gloriously, or if you are west, why not wistfully wander over to Chelsea to see Duke of York Square gloriously dressed in festive lights. If you are seeking a stroll along the South Bank find yourself a bag of roasted chestnuts and be dazzled by the Christmas lights twinkling next to the Thames. You may, however, wish to do more than enjoy the festive fairy tale illuminations that adorn the city streets. Whether it’s mulled wine and a mince pie as you make your way through the magical markets or a theatrical performance, pantomime, a pub or a Michelin star slap up the meal with your nearest and dearest under some mistletoe. London truly has something for everyone.Here are ALFIES top 5 things to do to close 2016 with some sparkle. Here are ALFIES top 5 things to do to close 2016 with some sparkle. This annual European festive fun fair settles in central London for its tenth year and is not to be missed. Wrap up warm and head into the heart of Hyde Park for a free Yuletide ride. Whether it’s the fairground rides, child-friendly Santa Land, including Santa’s grotto, or the Christmas markets, Winter Wonderland is a real treat for anyone feeling the spirit of the season. If you are with child, this year also ushers in Zippos Christmas Circus’ and ‘Cirque Berserk’ whilst the sturdy Winter Wonderland ice rink, the biggest outdoor rink in the UK, surrounds the Victorian bandstand and is illuminated with more than 100,000 lights. 2016 also sees a new family-friendly ‘Sooty Christmas Show’ with Sweep, Soo and TV’s Richard Cadell all making appearances. This year the Magical Ice Kingdom presents an ‘Arctic Adventure’ complete with icebergs, shipwreck and a polar bear palace. Along with the 60-metre observation wheel, rollercoasters and fairground rides will keep thrill seekers happy. For those seeking a warmer experience inside and out, there are twenty themed bars with real fires and the Ice Bar where you can imbibe the local lager out of its very own ice cups. Wander along an illuminated trail through beautiful botanical gardens or celebrate with champagne in style with our partner Lifestyle Tickets offering tickets for what promises to be a truly special occasion. Now in its fourth year, the new 2016 winter trail is inspired by the Gardens themselves. Walk in between two giant Christmas trees festooned with ribbon and wander beneath unique tree canopies drenched in seasonal colour. Follow the path between a carpet of light gently swaying like a blossom and stop for a moment of reflection at the scented Fire Garden inspired by Five Gold Rings from The Twelve Days of Christmas. Continue towards glittering trees dripping with giant crystals and gaze at colour-changing reeds rising high into the night sky. Just ahead glimpse the Tunnel of Lights, this year animated by over 60,000 lights making patterns and pictures to a festive soundtrack. If you’ve never been to London’s famous horticultural heaven, then now’s your chance. It’s definitely worth the extra trek. For the children, there’s a Victorian-style carousel, face painting and the chance to see Santa in his woodland grotto. If you’re looking to take someone special on a date, why not opt for a romantic wander through the lusciously lit grounds before sauntering off for some of that special champagne. London has an abundance of stunning ice-skating rinks. Maybe you are an Olympic festive figure skater, or maybe you just enjoy clinging on to the sides of the skating rink as you attempt a clumsy and somewhat embarrassing ice skating session to impress your other half. 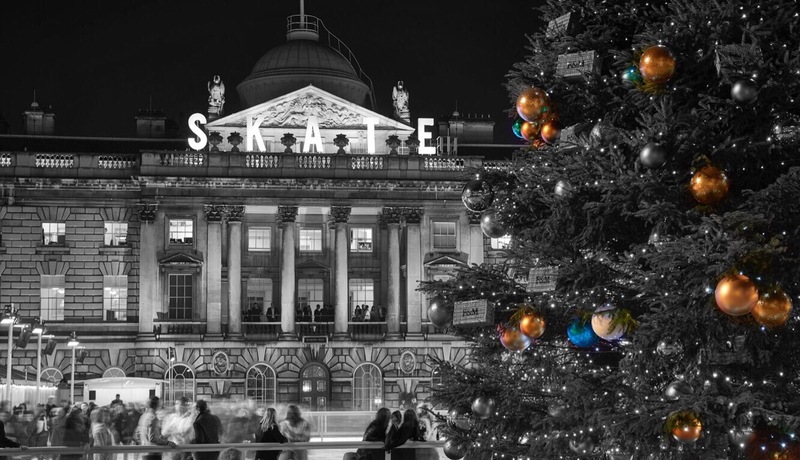 Our pick is Somerset House’s glorious 18th-century courtyard ice rink, in the association this year with Fortnum & Mason. If you’re thinking about venturing on a wild night out in the next two weeks, consider their exclusive Club Night with music from top international DJs. You will also find the Fortnum’s Lodge and the Skate Lounge with its own pop up Fortnum’s Christmas Arcade. For those wanting to get their skates on elsewhere, explore the magnificent views of Henry VIII’s residence at the Hampton Court Palace ice rink, or skate in the shadow of the spectacular Tower of London. Perhaps you fancy a glide around the Christmas tree at the Natural History Museum’s magical ice rink. If you fancy stepping away from the world of work in the City, wrap up warm and go for a spin on the Broadgate Ice Rink, before dining on some dim sum at Yauatcha one of our fine restaurant partners. If you are a corporate cat in Canary Wharf, take a twirl on the ice as colourful lights dance beneath your skates. 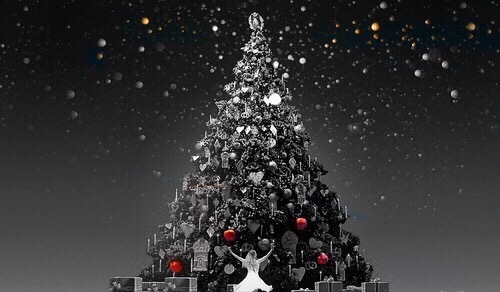 Our choices this December are the enchanting candlelit performance of The Little Matchgirl and magical world of The Nutcracker at the Royal Opera House. If you want to get a little racy try La Soiree: Christmas cabaret, in Leicester Square. If you’re looking for a fantastic musical then London’s theatre land is abundant with amazing masterpieces, or if perhaps it’s an evening of sensational ballet you’re seeking, try The Red Shoes at Sadler’s Wells. If it’s festive fun with the family, then discover the classic story of The Very Hungry Caterpillar and other children’s tales, or let the little ones see all of their favourite Disney characters during Disney on Ice ‘presents Frozen’ at The O2. Potted Panto might be your preference at the Garrick Theatre, or you can enjoy the magical tale of The Snowman at the Peacock Theatre. Maybe someone has persuaded you to take a family trip to Legoland Windsor, to meet Father Christmas and spot festive-themed LEGO creations. For the more scientific, be dazzled by the moon, planets and galaxies with the cosmic Christmas planetarium show at the Royal Observatory Greenwich. There is nothing more memorable than mulled wine in a mug keepsake Christmas mug as you stroll one of London’s winter markets. Whether it’s the Winter Festival at Southbank Centre, seasonal treats by the River at London Bridge City, or the more than 100 stalls at the festive Greenwich Market we choose them all. Why not even try the wooden cabins at the riverside Tate Modern Christmas Market for stocking fillers and original gifts or muddle amongst more than 100 stalls at the Christmas Fair at Chelsea Physic Garden. Browse the market stalls at Christmas in Leicester Square, or amble around the Kingston Christmas Market, overflowing with foodie treats, lovely decorations and handmade crafts. Finally, you’re all extremely spoilt. London has one the most superb shopping centres in the World so you have no excuses when it comes to buying gifts for your gang. If its famous food you’re seeking then why not try to grab some gourmet Christmas treats and hampers at Fortnum & Mason for your family or friends. Visit the West End’s famous staple shopping hubs of Oxford Street, Bond Street and Regent Street, or head to Covent Garden and nearby Seven Dials for a diverse mix of designer labels, vintage stores and high-street brands. Check out Carnaby Street’s independent shops and cool fashion boutiques, or enter the enticing esplanades of London’s famous department stores’: Harrods, Selfridges and Liberty. If you’re looking for extra brownie points and you can muster some courage, take on one of London’s top 10 toyshops, or if it’s a quieter haven you’re seeking to forage the books from the five-floor Foyles. London truly inspires stupendous seasonal sessions and its all for the taking right now. Let us know where you go to make Christmas special across the City. In case you are considering travelling abroad this Christmas, take part in our New York trip giveaway for a chance to win a luxury trip for two. A bespoke private marketplace to buy and sell to fellow colleagues in your in your marketplace.